New publishers seem to crop up each and every month, often spawned from a developer or marketing company that has decided to expand its business on the back of its own success. But when it comes to mobile, publishing is increasingly about user acquisition. To that end, PlayIgnite has a £100m warchest to pump into UA, while Tilting Point is commiting $132m investment into UA annually. Others meanwhile, such as Fingersoft’s publishing label Round Zero, as well as devs/publishers Voodoo and Ketchapp, have large existing userbases to cross-promote with. Now in steps a newcomer to the space: mobile marketing platform AppLovin. It’s opened a new division called Lion Studios that promises to help developers publish and promote their apps through “cost-effective user acquisition”. Through Lion Studios we help mobile app developers publish, promote and get their apps discovered. “We are a single, comprehensive platform that offers everything developers need to publish, finance, monetise, and grow their mobile apps and businesses,” Lion Studios president Rafael Vivas (pictured main, left) tells PocketGamer.biz. It already has significant successes in driving hundreds millions of downloads, generated before its official announcement. SuperTapX’s Love Balls, for example, was downloaded more than 100 million times in less than three months. 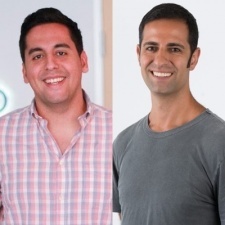 “AppLovin supports fresh ideas and drives growth for all app developers, which helps to level the market and create healthy competition that makes the industry better,” says AppLovin CEO Adam Foroughi (pictured main, right). “We started Lion Studios because we saw an opportunity to add resources for AppLovin customers and to provide those resources across all channels on mobile. While not exclusive to publishing hyper-casual games, Lion Studios has certainly had early success in the space with Love Balls. It’s an area of gaming AppLovin is no stranger to - the company’s international MD Johannes Heinze wrote a series of articles ahead of the curve right here on PocketGamer.biz about the ascendance of hyper-casual. Vivas admits that, much like the rest of the mobile world, it is “super bullish” about the space, something which is reflected in its catalogue. If there were an easy formula or playbook for this, then everyone would do it. “The hyper-casual experience is precisely tailored for mobile,” explains Vivas of hyper-casual’s popularity. “It’s addictive, which is good because people always have their phones by their sides. It can be played for hours on end, or for just a few seconds at a time. Life is full of idle moments and short lines - what you call queues in the UK - and hyper-casual games can even be played in those 30-second bursts, whereas heavier games wouldn’t even load in that time. “And like mobile, hyper-casual is universal. There are sparse or no words, so there is no language gap, and these games have the shallowest learning curve imaginable. But how is Lion Studios driving such large numbers of installs for hyper-casual games and others, at what it claims to be a “cost-effective” rate? Vivas coyly says it’s the company’s not-so-secret sauce, which comes down to “knowledge, smarts and hard work”. “That is what we do at Lion Studios, and that is what we are offering to developers who partner with us,” he says. Following the launch of the new division, Lion Studios opened up a $300,000 competition for developers, which runs until August 13th. It’s looking for independent mobile game studios with fewer than 30 employees, whose submitted titles have fewer than 100,000 installs. Qualifying developers can submit up to three titles each. You can find out more about the contest here.